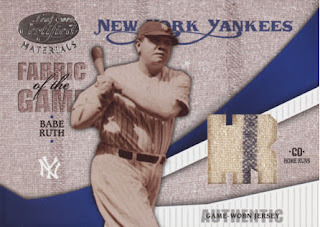 Because of the state of the economy, many people look to sell their memorabilia and card collections to make ends meet or supply disposable income for more current pursuits. I warned the two people that I am doing vintage consignments for that if they didn't need the money they should think of waiting. Needless to say for their own particular reasons they choose to sell. On the flip side, a down economy also creates an opportunity for collectors with discretionary money to acquire long coveted items for deeply discounted prices strictly due to the lack of bidding competition between people with money to drive prices higher. An excellent example of how this is effecting the current auction market can be seen with the results of Collect.com's recently completed final sales numbers. This catalogue provided a wealth of quality cards and memorabilia, almost, all of which went at ridiculously low prices. Higher end modern cards fared ok as evidenced by these two cards. That said, if you HAD to choose between one or the other, which one would you want and why? They both sold for $527 each. So you can have either one. Which is it going to be? If I had to pick one, I would go with the Leaf. That Timeline card looks hideous. Eventhough it has relic pieces gallore, it doesn't make up for bad design. The Leaf is the lesser of two evils. 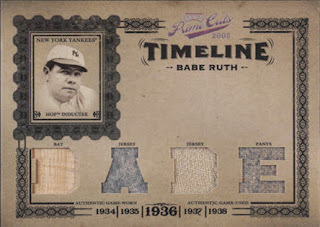 I'd go with the 04 Certified, in part because it is serial numbered 1/3. Is the Timeline card serial ##?? Leaf. I think the ol' FOTGs are purty.